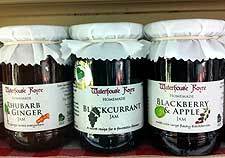 There are many different names for fruit preserves, and many more recipes to consider. However, the fundamentals are all the same, whether or not you are making a jam, fruit preserve, compote, jelly or marmalade. The resultant preserve is a mixture of fruit and sugar that has been boiled so that it will set, with the main differences being consistency, texture, colour, flavour and clarity. A spiced condiment rather like a savoury jam, chutney originates from India and is made with a mixture of fruit, vegetables, sugar, vinegar and spices. The amount of spices can vary greatly from recipe to recipe, with mango chutney being especially mild and sweet, and regularly served as an accompaniment to poppadoms in Indian restaurants. A conserve is a chunky jam-like mixture made using more than one type of fruit, along with the frequent addition of raisins, nuts and citrus fruit. Conserves are often spread on bread and pastries, and also served with cheeses and meat salads. A compote is a thick syrup that features whole pieces of fruit, often being served as a dessert with cream, either hot or cold. Types of compote include blackberry, blueberry, raspberry, rhubarb, strawberry and summer fruit mixtures. The syrup is often flavoured with vanilla, citrus peel, cinnamon or other spices. Curd is a creamy dessert spread made using a mixture of sugar, butter and eggs, as well as the juice and zest from citrus fruit. The ingredients are gently cooked on a low heat until a smooth paste is formed. Homemade lemon curd was a popular treat in 19th-century England and was used as an alternative to jam, being a fashionable filling for cakes and tarts. This sweetened spread is made using fruit that has been slowly cooked with sugar to form a smooth paste. Popular recipes include apple butter and also prune butter. Spices and lemon juice are often added, although despite its name, butter is not actually used as an ingredient. The exact definition of a fruit spread is a little vague, although it is generally considered to be a low-calorie smooth jam made using concentrated fruit juice and found on supermarket shelves. Sweetness is provided by artificial sweeteners, although some sugar may still also be added, according to the actual recipe. The term 'jam' tends to cover a wide assortment of different fruit preserves, being made using chopped fruit and sugar. 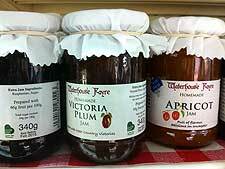 Although jam may contain fruit pulp, it is most usually a smooth fruit spread that does not contain any chunks of fruit as such. A clear spread and an American name for jam, jelly is made by combining fruit juice with sugar. Pectin or a similar setting agent is a necessary addition, while some jelly recipes will also include lemon juice and involve lengthy periods of straining cooked fruit to extract a clear liquid. Marmalade is rather like a citrus-based jam / jelly, with pieces of citrus peel and fruit being suspended within the set mixture. The recipe for Seville orange marmalade is hugely popular in England, with the tartness of the orange peel being offset by the sweetness of the added sugar. 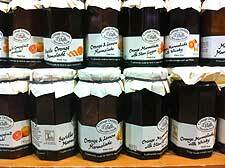 Marmalades originate from Roman times and can also be made using grapefruits, lemons, limes, kumquats and mandarins. A fruit preserve is simply a jam with soft pieces of fruit within the mixture. These fruit pieces may be whole berries or chunks / slices of large fruit, such as apricots, blackcurrants, cherries, figs and strawberries.